The 1990s were Selig's decade. The quintet got together in 1993 in Hamburg and produced a demo that quickly procured them a contract. 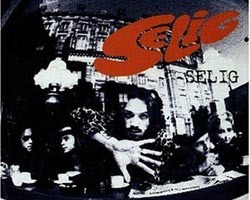 Early the following year their self-titled debut album Selig appeared. It climbed into the Top 40 on the German LP charts and placed 12th in the Austrian charts. The videos for the singles "Sie hat geschrien" and "Wenn ich wollte" were played repeatedly on music TV channels; the latter even took home an Echo Award. Riding on the wave of their initial success, the band wasted no time putting out their second album Hier in 1995. The songs had a darker tone, a harder rock sound, and were more experimental than those of the debut album -- something their fans apparently liked. Their second "hippie metal" album landed in the Top 20 on the German album charts. It also launched them on an album tour and led to invitations to perform at multiple music festivals. Amongst the media buzz surrounding their success, Blender appeared in summer 1997, the greater part of which was recorded in New York. This third LP brought a notable shift in their musical style. Different from their previous work, the songs largely abandoned the band's signature rock sound. Instead their music included unmistakable pop elements and experiments with electronic instrumentation. The new sound met with conflicting reviews. It was interpreted by some as a sign of maturation, by others as a misguided move in the wrong direction. The album was embraced with little enthusiasm from fans and failed to produce a single hit. After working just long enough together to put out a greatest hits album, the band split up in January 1999 -- presumably because of the flat public reception of Blender. Christian Neander founded the new rock band Kungfu in 1999 and Jan Plewka and Stephan Eggert later joined with Marco Schmedtje to form the band Zinoba in 2003.  The band played most of the music for the 1997 German film Knockin' on Heaven's Door by director Thomas Jahn.  After releasing 2 albums -- Glaskugelsammelbehälterkasten (1999) and Kungfu (2002) -- the members of Kungfu split up to pursue solo projects in 2003.